Pro unity demonstrators wave Spanish and Catalan flags during a protest after the Catalan regional parliament declared independence from Spain in Barcelona, Spain, Oct. 27, 2017. The Catalan regional parliament voted for independence from Spain Friday by approving a resolution to convene a constitutional assembly to form a sovereign republic. The move was accompanied by applause and embraces between lawmakers present, who sang the Catalan anthem. The resolution to secede from Spain was drafted and presented by the more radical separatist factions of the regional coalition headed by Catalonia President Carles Puigdemont, and it passed by 70 votes in favor, 10 against and 2 blank votes. Spain's ruling center-right Popular Party and the mainstream opposition socialists, who hold just under half the seats in the Catalan parliament, boycotted the session. Catalan President Carles Puigdemont sings the Catalan anthem inside the parliament after a vote on independence in Barcelona, Spain, Oct. 27, 2017. Friday’s resolution by the Catalan regional parliament ends a period of uncertainty over Catalan independence that has prevailed since an Oct. 1 referendum on independence that won 90 percent of the vote in a 50 percent voter turnout. Puigdemont has held back from declaring independence for fear of triggering direct rule by the central government, which has been moving to take over the region's finances, police services, and key infrastructure and administrative bodies, including publicly financed TV and broadcast media. “It was very astute on the part of Puigdemont to let parliament vote on independence resolution prior to declaring it, as it gives him certain legal cover,” a former senior member of the Spanish parliament told VOA. Puigdemont could face a 25-year prison sentence for sedition. The central government already has jailed two separatist leaders and is prosecuting other officials accused of using public resources to support the independence bid. Immediately following the Spanish senate vote to impose direct rule on Catalonia, the government issued an official bulletin announcing that Puigdemont and his Vice President Orio Junqueras had ceased to be the heads of the Catalonian regional government. FILE - Spain's Prime Minister Mariano Rajoy speaks to media in Amari air base, Estonia, July 17, 2017. 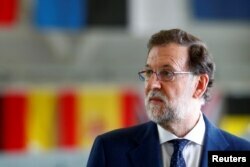 Spanish official sources consulted by VOA say Spanish Prime Minister Mariano Rajoy is preparing to appoint a close aide of Catalan origin to head a centrally administered regional government, and he has set Dec. 21 as the date for regional Catalan elections. Spain’s Senate responded to Catalonia’s independence move by approving the application of constitutional article 155, which officially authorizes the central government to suspend Catalan authorities and take over the region’s administration. “The turn of events ... has left us with no recourse but the application of constitutional prerogatives to reinstitute the legal order in Catalonia,” said Spain’s senate president. Rajoy appealed for national “calm” and called together a special cabinet meeting for later Friday. “The government will take whatever measures are necessary. We will not allow a group of people to liquidate the country.” he told reporters. Spain's Socialist Party leader Pedro Sanchez arrives at the EC headquarters ahead of a meeting with European Commission President Jean-Claude Juncker, Oct. 19, 2017. Even regional authorities in the traditionally nationalistic Basque region have been reluctant to support the Catalan cause, despite growing relations between radical separatists in both regions. 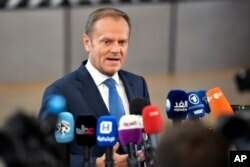 European Council President Donald Tusk speaks with the media as he arrives for an EU summit at the Europa building in Brussels, Belgium, April 29, 2017. Russian President Vladimir Putin gestures while answering questions at a meeting of the Valdai International Discussion Club in Sochi, Russia, Oct. 19, 2017. Some international support for Catalan independence, however, seems to be coming from Russia, which is giving some recognition to Catalan separatists as reciprocal action for past U.S. and European backing to breakaway former Soviet republics and the controversial independence of Kosovo. 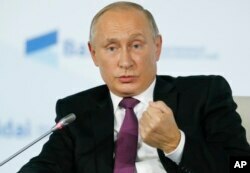 “By backing the independence of Kosovo, formed and prosperous countries such as Spain put at risk their own fragile stability,” Russian President Vladimir Putin said last week at an international forum in Sochi. “It's undeniable that Putin is interested in the destabilization and balkanization of Spain,” a senior Spanish diplomat told VOA, asking that his name not be used. 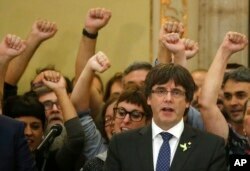 South Osetia pledged support for the “sovereignty of Catalonia” following the Oct. 1 referendum. Rogue states such as Venezuela and North Korea also have expressed support for Catalonian secessionism.